▶ TOP Blood Pressure app in number of countries. 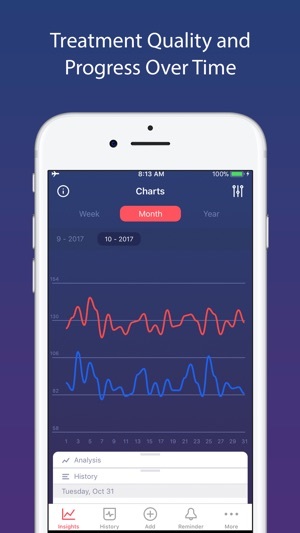 ▶ Track your treatment quality and progress over time as well as discover unique patterns in your blood pressure. ▶ Learn how to take under control your blood pressure. ▶ Web app for your doctor to access your blood pressure remotely, no more hassle with export and print. 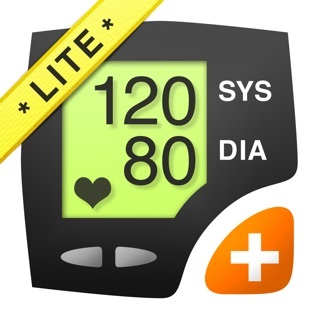 ▶ Easy to use and at the same time comprehensive app to save BP logs and share it with doctor.
! 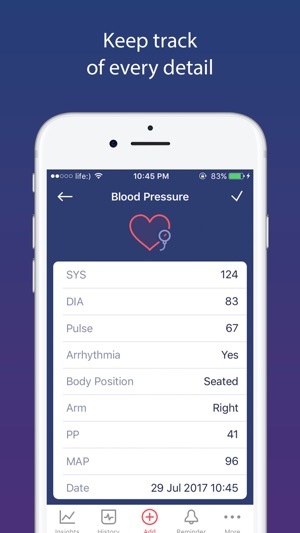 If you want to improve or have something to add/fix - please, write me using feedback form in app or email me directly e@ihealtho.com, lets make the best blood pressure app together. I need you! - Blood pressure with Arrhythmia parameter, body position, pulse pressure, mean arterial pressure, measurement arm . - Drugs - we integrated GoodRx service for you to search drugs. ▶ Analytics. Get comprehensive date by date comparison and see how your treatment goes! ▶ Insights. 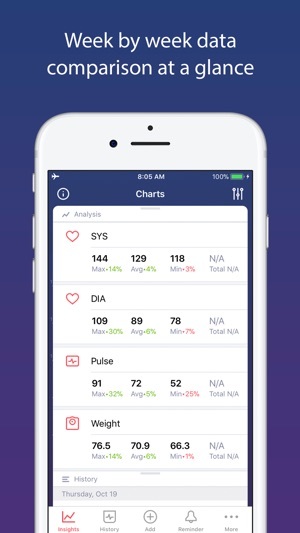 This is the only app which can analyze and shows you how different factors influents your blood pressure. See how gaining or loosing weight affect your BP. Soon you will be able to see how drugs and other custom parameters affect your BP. ▶ History. Keep all your data in a beautiful and useful calendar. Easily view and edit all saved data. ▶ Share. Share your data with friends or family members to keep them notified of your current feeling and historical results. You can also e-mail your doctor or other medical professional as part of your personal healthcare. 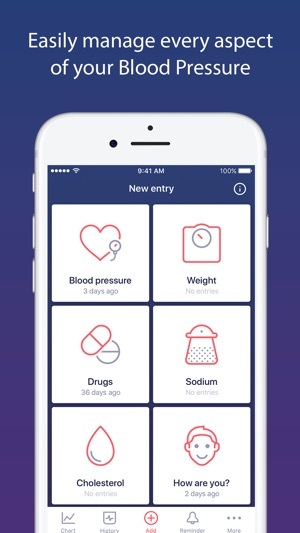 ▶ Blood pressure web app. 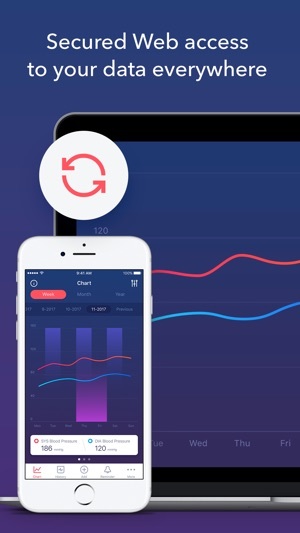 Get full-screen comprehensive charts via the web app. ▶ Back up. App securely back-up your data in the cloud over SSL protocol. So you will be able to view, retrieve and sync all your data across all your devices. Disclaimer: Blood pressure monitor is intended to be used as a means to collect data to be shared with your doctor. This application is not intended to be a substitute for professional medical advice, diagnosis, or treatment. We assume no liability for any personal harm or injury sustained as a result of using this application. Please note, it is not possible to measure your blood pressure by touching the screen. A separate device (blood pressure monitor) is required. I wanted to like this app, but it’s useless. During initial set up after I gave it authorization to use Apple Health, it froze during the import process. So, I closed it completely. After reopening, it became stuck on the first page of the instructions/available information demo. I closed it out completely again. After opening a third time, it showed me that it did import info from Apple Health app, but that screen was frozen too, so I was not able to access the information it imported. Additionally, I only wanted the app to be able to read my systolic and diastolic blood pressures and my weight. The app told me I had not given it permissions to access Apple Health when I clearly had; just not everything it had asked for. This app is so buggy, that it is a complete waste of time to attempt to use. I even went so far as to sign up for the premium services, it still didn’t work. So, I immediately cancelled the subscription. This app should be removed from the App Store until it is ready to use and no one should be charged the cost of a subscription service. Hi! Sorry for inconveniences! I'm aware of this issue and working hard in order to resolve it. It happens when you have a lot of data in health kit and app needs some time to extract all data. You can grant permissions only for SYS/DIA/Pulse/Weight and then use the app, in this case, you will avoid freezes. Sorry once again. The Blood pressure app is a clear winner! It had to be developed by medical professionals because of its intuitive, straightforward design to log vitals. This app seamlessly syncs with Apple HeathKit. The graphical tracking screens are prefect for trending, BUT the “Stats” screens really give you important information on your blood pressure recordings in a meaningful way. Blood Pressure has excellent sharing ability, and can export a colorful, detailed PDF report that you can bring to your doctor! The app also allows every entry to be custom tagged, which is extremely useful for tracking medication adjustments and results. Overall a 5-Star app with a ton of great features and definitely worth the price! I found this app, and after reading all of the reviews I downloaded it. After a few days, it looks like it has everything you need to accurately track BP, heart rate, and also weight. I already had an Omron BP arm cuff, but the ability to track this information and share it with my cardiologist is no doubt going to be very helpful. I haven’t used every aspect of the app yet, but it looks like the perfect tool. I’ll upgrade to the paid version after a month of trial, and update my review at that time. Thanks a lot! Appreciate your feedback!